Emma Rigarlsford and Matt Henderson, students on the Graduate Diploma in Law (GDL) in The City Law School, won the 2015 University of Hertfordshire (UH)/Blackstone’s National Criminal Advocacy Competition held from 3rd to 5th July. Emma Rigarslford and Matt Henderson, students on the Graduate Diploma in Law (GDL), in The City Law School, were First Prize winners in the 2015 University of Hertfordshire (UH)/Blackstone’s National Criminal Advocacy Competition, held from 3rd to 5th July. Henderson also carried off the Individual Best Advocate trophy during the competition. The City pair faced stiff competition from teams representing the University of Northumbria (4th) Sussex University (3rd) and the University of Exeter (2nd). Max Hill QC, the competition’s judge, was very impressed with the high standard of all teams. The competition involves students undertaking a series of mock trials and pre-trial applications such as those relating to bail and character. The aim of the competition is to introduce undergraduates and GDL students to day-to-day advocacy activities/skills. It also enables participants the opportunity to learn and develop different practical skills to those that can be obtained through mooting alone and which will be common from the outset of your future legal career. Participants in the competition undertook a mixture of pre-trial applications such as bail applications and character applications and mock trials. Teams conducted an examination-in-chief and a cross-examination of a witness and also delivered opening and closing speeches. 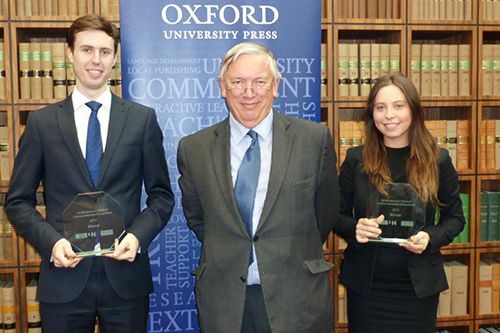 Rigarlsford and Henderson each won £250 of Oxford University Press (OUP) book vouchers, a mini-pupillage with 4 Breams Buildings, individual trophies and the competition salver. They are grateful to their lecturers, Marcus Soanes and Simone Start, for their guidance at various stages of the competition. The City winners now have the opportunity to compete in a Trans-Atlantic competition against students from American universities which will take place in the Rolls Building in London around late August/early September 2015. The primary questioning of a witness during a trial that is conducted by the side for which that person is acting as a witness.